I was awoken at 5:15am to rain pelting the side of the thin building I was sleeping in. Hey, improvement that it at least happened after 5am! I was so happy to have landed on this day to be in town and to be in a heated room! Today’s forecast was for cloudy weather and the rain to stop around 7am. I got ready leisurely and walked out of town (yep, that half mile again) and was back on the trail by 7:30am. Five minutes later, it rained again…and continued to lightly rain intermittently the rest of the morning. Does this bird have a really long and loud call like a car alarm? Looks guilty to me. 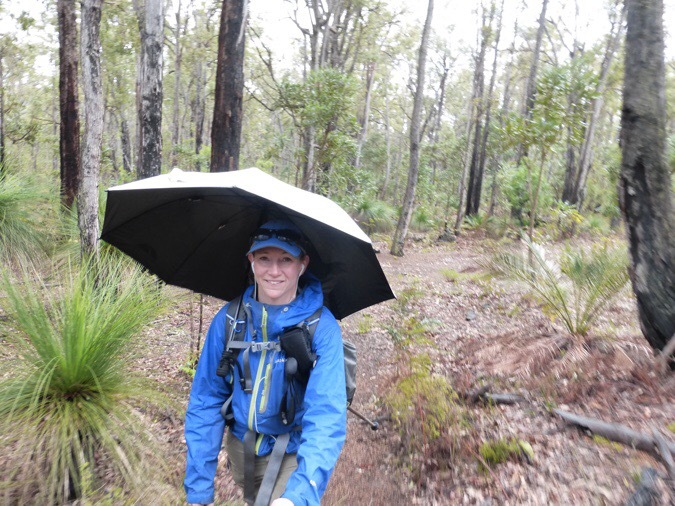 Thankfully, it was just drizzles of rain and the wind was dying down. It helped that I was in denser woods in the morning. Today I was on an actual wooded trail the majority of the day rather than large chunks on old roadbeds. I enjoyed it and I listened to the Kindle book I have about the creation of the Te Araroa by Geoff Chapple. I needed to save this one for when I was doing a shorter leg because I listen to it through the Kindle App and have the iPhone read it aloud. Although it is robotic, it is a way for me to be able to have this book read because it is not an audiobook. The book is quite lengthy and just keeps going, so I was happy to have a day to finally finish it out. Not my favorite book, but it surely gives me some background and a good perspective on the upcoming Te Araroa in New Zealand. It can be an under appreciated trail because people put too high of expectations on it because it is in the dreamy land of New Zealand. People need to understand that this trail is still in its infancy and there is a lot of logistics in getting a trail to go through a whole country. The US is fortunate that we have things set in place to protect and preserve long trails. Much of the TA in the North Island is on various roads because there is a lot of private farming land. I feel like I can usually guess how many seconds it will take for someone to recommend to me that I skip much of the N Island when I mentioned the TA. I am fully aware of what I am in for, and I do not have any plans of skipping the N Island or doing it in an alternate way, so please refrain from further comments on that topic. Yes, I’ve been warned plenty. I am going to do my best to appreciate it for what it is, and understand that I am doing something that is very rare in the world, which is walking the full length of a country. Part of that is not only experiencing the mountains, beaches, and beautiful scenery, but also the roads, highways, cities, and farmlands. I know it won’t be the most stellar experience on the north island, but going in with the right expectations can greatly affect the experience. I enjoy walking, and I’m going to go into it with an open mind and an understanding that there are limitations in New Zealand. I am going there to experience all of it, not just the cool mountainous parts. I stopped at Swamp Oak Shelter at 10:30am, and since it was drizzling and cold, I decided it would be a good spot for my lunch. 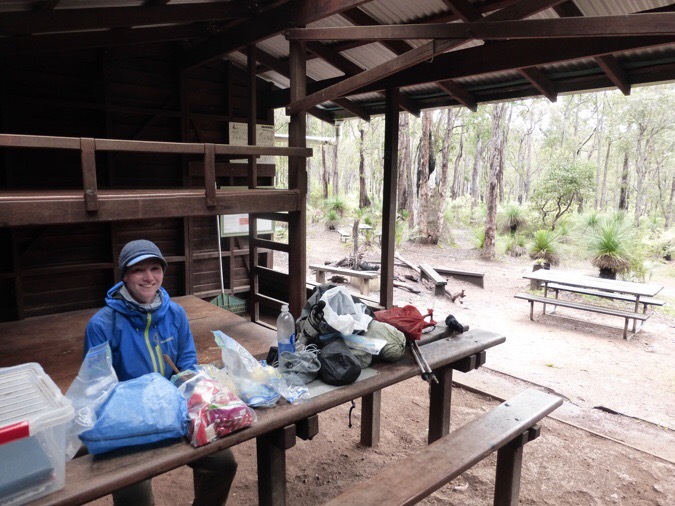 I had an early lunch in the comforts of a dry and sheltered area while some birds joined me. There was one cute little one with a blue tail and another one that was a bright blue color that I could not get a photo of. It was cobalt blue and very striking. 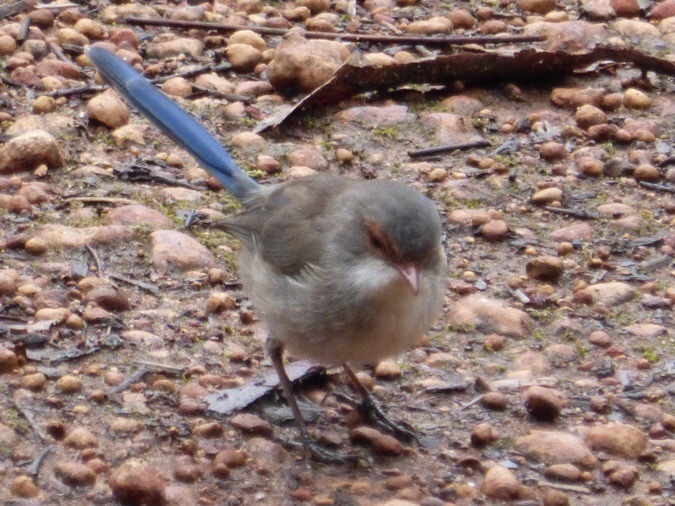 Is it a blue wren? Lunch in Swamp Oak Shelter. The hiking today reminded me of the Appalachian Trail again. There were more long ups and downs than there have been in any other section before. It felt like a completely different trail with different trees and a much more wooded and enclosed feeling. I liked more of the trail feel. 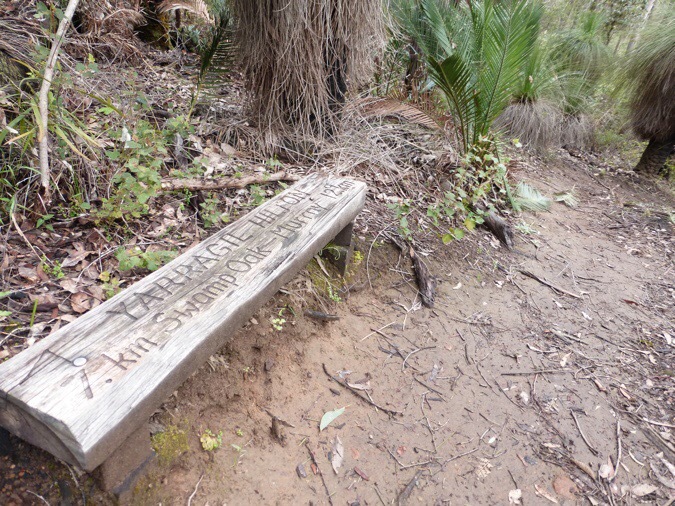 Cute benches were on some of the steeper climbs for people to rest. Soon after lunch, I was coming down the trail to an old road, when I saw a large truck doing a u-turn at a dead-end where my trail was coming out. 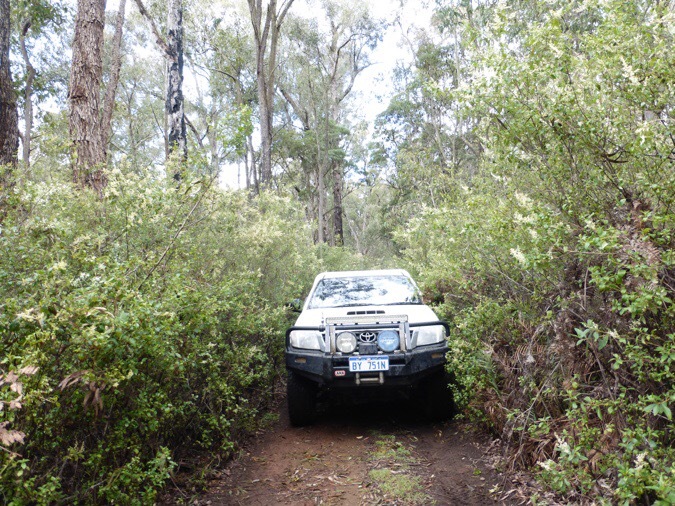 It was startling to see a vehicle there and it seemed almost impossible that one would fit through these narrow roads. About 20 minutes later, I heard someone calling out in the woods and yelling for something and I came around the corner to see this parked in the middle of the trail. There should definitely not be any vehicles out here, and it was kind of creepy, but then it was a young couple looking for their dog. They were hunting pigs, which they said they knew was not legal here and they lost one of their three dogs. All the dogs have huge tracking devices on their collars with antennas on them and he had a GPS to track them. I am guessing this has to do with the hunting as well but didn’t ask. 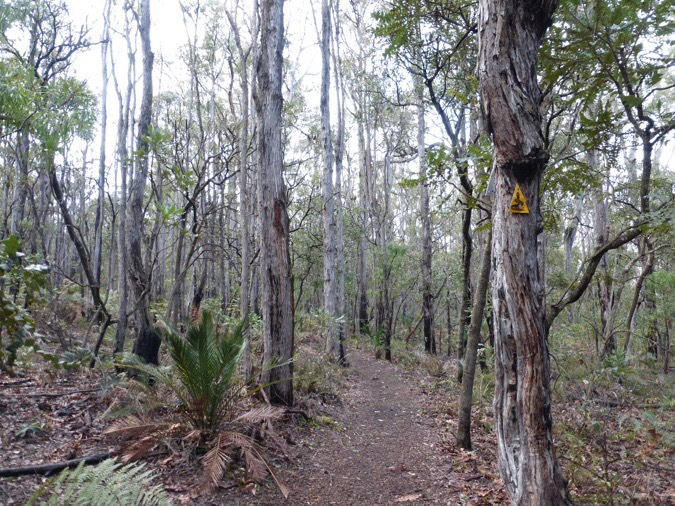 They knew they were on the Bibbulmun Track too, which was interesting. So, they were fully aware that they were doing something they shouldn’t be doing. 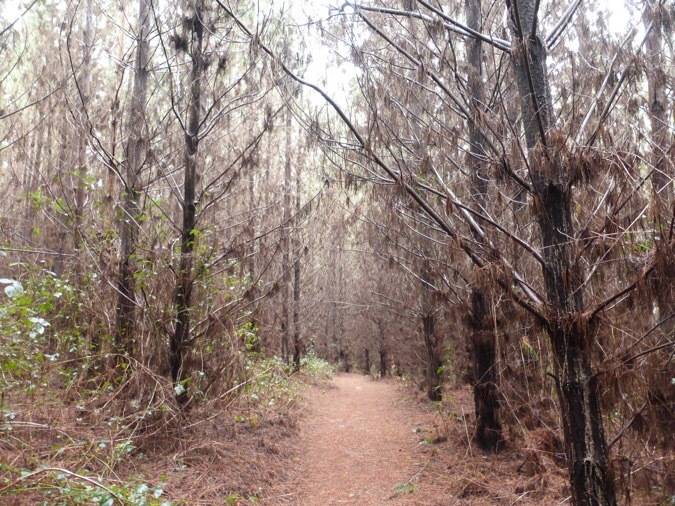 All of these back roads would be heaven for four wheelers and motorbikes but they are closed and quarantined to control the spread of a fungal plant disease called dieback. 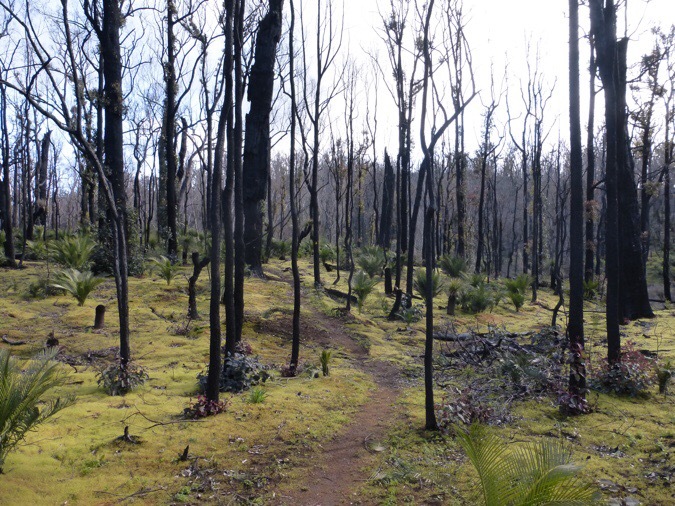 Dieback is killing all of these unique and irreplaceable trees and plants. There are even cleaning stations for hikers when we pass from one area to another to rinse off our shoes and hiking poles so we don’t spread it into areas that are being affected. The maps are clearly labeled and pretty much all roads are closed off for vehicular use. In the afternoon I was hiking up higher on a nice, more open area, and could see the ridge across the way. It was very nice walking and quite enjoyable. It seems that there is a road up there because I can hear traffic all day in the far off distance. I got a shot of a new bird today while I was up there. I saw only one other person from a distance today. Which was when I reached the Murray River. The trail is now paralleling the Murray River since this afternoon. When I first reached it, I saw a man and his son car camping right next to the river. It was a bit down from the trail but they had come on off one of those closed service roads and had a fire going, which is also not allowed I believe. 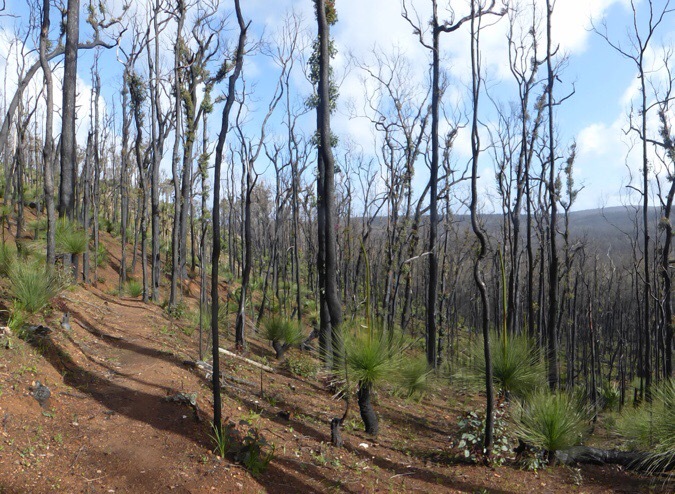 This area was hit by a very large bush fire in 2015 and everything is blackened. The ground is quite pretty with a lot of green, which must be because of the river water. I got to the Murray Shelter at 3:30pm and had heard it had burnt down, but was surprised to see it still standing there. There is a tarp over some melted parts of the roof, but it appears people are still sleeping there. 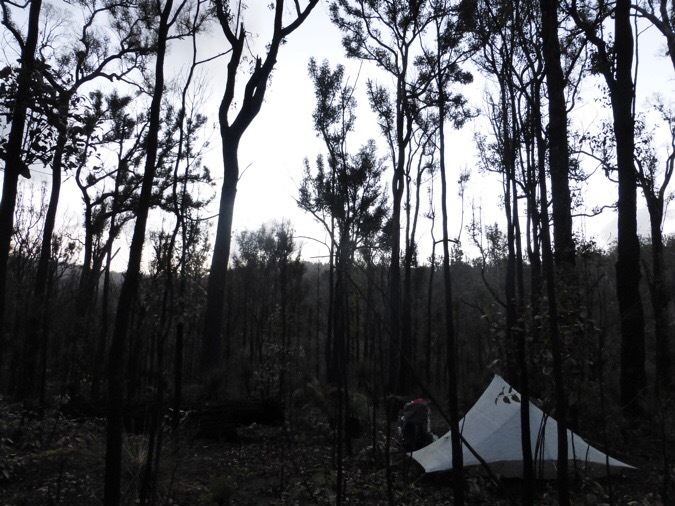 It has a gorgeous spot right on the Murray River and is my favorite location thus far for a shelter. Also, many people wrote that they saw pigs in this section. I didn’t see any pigs! The last couple hours of the day, I was walking on a nice hillside with a winding trail through the burn area. 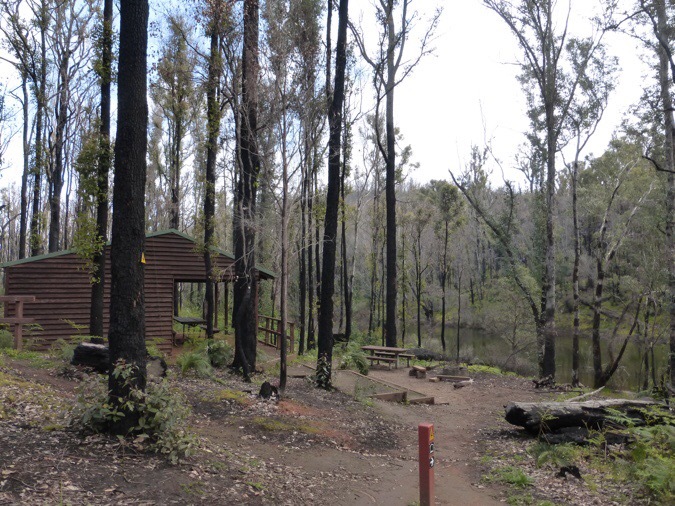 It was right along the Murray River with a nice view of the ridge across the river and views looking down on the river. Quite a pleasant day and I was happy that the rain let up the second half of the day. Every once in a while I even got a bit of sunshine. 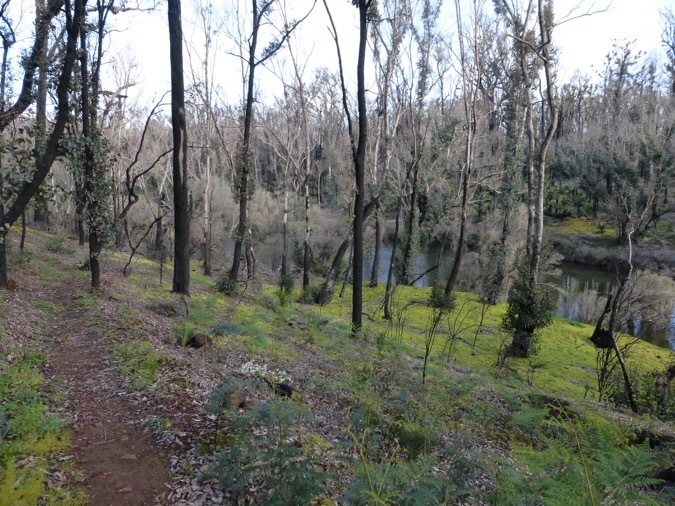 Trail along the Murray River. I hiked until I found a good spot along the river that was up out of the valley floor a bit. It was colder and damper just a bit lower. I have a feeling, I’ll still have condensation, but not as cold as it was directly along the river. I’m super cozy, there’s absolutely no wind or clouds, and the temps are just right. The only sound is a duck and bird chatting away far down by the river. They are losing steam though. It’s not even 9pm yet, and I’m ready for a good night of sleep! It seems it will be back to rainy tomorrow and the next day, but I’ve heard it’s not supposed to be more than showers. I hope that’s the case! Thanks for sharing the bird photos. I’m enjoying the variety. First, what part of ‘hike your own hike’ do people not understand? You can walk the path you d*mn well please. Second, hope I’m not being tacky to wonder if you could forward that pic of the truck to someone who might care since you got the license number. –Loving the birds! 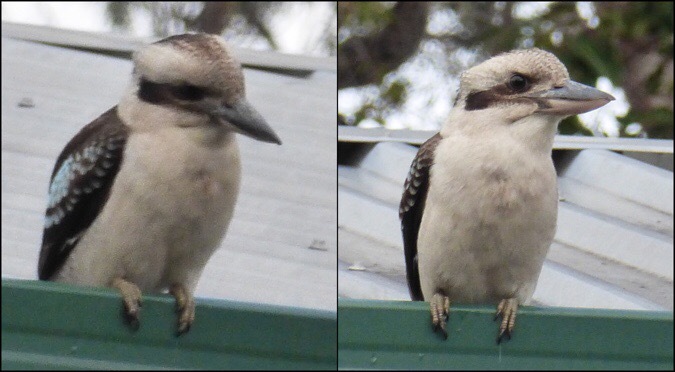 Erin, I’m fairly certain the bird in the first photo is a Kookaburra. They have a really loud call that sounds like human laughter. Just looked it up on YouTube. I’ve heard that, but there’s a car alarm sounding one I need to record next time. Hi! The first bird is indeed a Kookaburra with a very distinctive call! You are correct about the blue wren, it is a female and the brighter blue one you saw is the male. Love our birds! So excited to show the boys you saw a Kookaburra! We listened to the song the other day and I told them we needed to ask if you had seen one yet. If you can ever get a recording, they would love it! 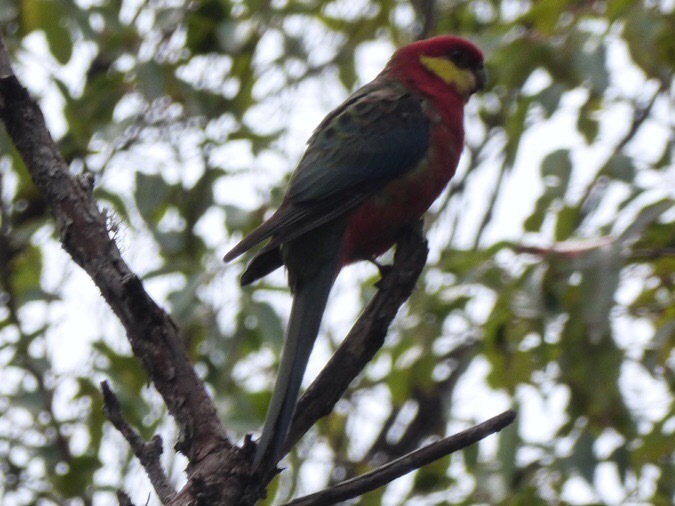 The picture of the parrot looks like it is a western rosella and most likely a male. First time, long time. I’m someone who will never long-distance hike so I love, love, love reading your blog and have been doing so for about a year now. I *really* am enjoying all the photos of the different wildlife! I never thought I’d get so excited to see photos of birds. Thank you so much for taking the time to write about your experiences. I wish you had a Patreon or something similar set up so those of us who love reading you could help let you do what you do. Hi Rose. I actually do have a link buried to a PayPal account in my “about” tab under the care packages section. People can PayPal to my email at erinsaver@walkingwithwired.com. So glad you’re enjoying it! Hi Erin, glad things are going well … but *please* do something about reporting that 4×4 .. just forward a link to the Australian police. It is so annoying, how little some folks seem to care. A bird that sounds like a car alarm is becoming more common these days because birds do mimic sounds they hear.. there is a bird in the Amazon that mimics the sound of a chainsaw. Is that sad, or what? Continuing to be impressed by the shelters and other facilities on this trail! I was going to say that you DID see pigs. They were the two legged, four wheeled variety. Love that you heard a Kookaburra. We have lots of wild parrots here in Orange County. The flocks don’t hang in my area. They are super loud when they get going. I really love seeing them. Hope those people get cited for driving in that area, probably illegal hunting, endangering a dog..
Never would occur to me to tell you where to walk… ? I’m with all the others. Love the flora and fauna. Glad you are safe out there despite the 4X4 and their prohibited activities. Long weekend disease = motorbikes and 4 x 4’s.